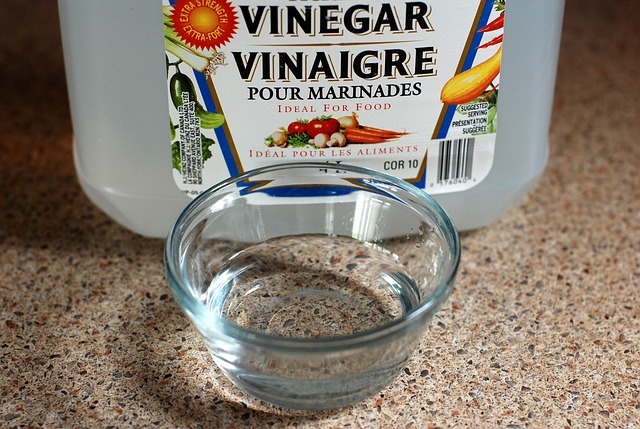 Do you know how to clean with vinegar? You have probably heard that vinegar and baking soda can be safe and effective household cleaners. And they can be. But not when you mix them together! Vinegar is a strong acid that can break down soap residue, oils, hard water stains, and glue from stickers. Baking Soda is an alkaline, and can loosen baked-on grease, absorb odors, and brighten teeth. Adding one to the other will neutralize their effectiveness and knock out all of their power. Distilled white vinegar is made from acetic acid and water. When combined with the sodium bicarbonate in baking soda you get a fizzy chemical reaction. This may be fun and exciting, but it isn’t actually helping you clean! After the foaming action, you are left with water and a small amount of sodium acetate salt; the bubbles are carbon dioxide escaping into the air. If you don’t have the exact perfect ratio of vinegar and baking soda, the water will have some acid or alkaline left in. That mild acid or alkaline solution, the physical blotting that is usually recommended, along with the placebo effect from the foaming action, and people think it works. When using vinegar as a cleanser, it is best to use white distilled vinegar. This is partly because you don’t want any color from the vinegar to stain what you are trying to clean. Also, because white distilled vinegar is made in a lab, instead of by natural fermentation like other culinary vinegars, the strength will be more consistent. A 50/50 solution of white distilled vinegar and water can be used to clean many surfaces in your home. Spray on windows and wipe off with newspaper for a streak free shine. This cleanser will work great on most hard surfaces in your kitchen and bathroom. However, do not use vinegar on hardwood floors, wax floors, granite/marble countertops, or egg spills (it will scramble the egg). It is a great rinse for fruits and veggies because it is a mild disinfectant. You can also soak a well used loofah sponge in the cleaning solution to dissolve soap residue. It is usually not a good idea to use vinegar to clean your carpet. If you have a natural fiber carpet the vinegar could cause serious and permanent damage. Most soiling in your carpet is acidic, and so a commercial alkaline cleaning will be the best choice. Pet urine has both uric acid and alkaline crystals, so it is especially best left to professionals. Adding too much liquid to a pet stain can cause it to soak in deeper to your carpet, pad, and even into your subfloor. If you have a hard water stain, like salty winter brine from snowy boots, you might want to try the vinegar solution to break down the calcium and other minerals. If your carpet has a build-up of soap in it from improper cleaning technique, you may want to try the vinegar solution. In both of these special cases, only if you know your carpet is NOT a natural material. Often times, simply removing surface dirt with a vacuum or brush, spraying a little water, and blotting from the outside in is the best way to treat common carpet spots. The technique is more important than the product, but you don’t want to use products that will damage your carpet.